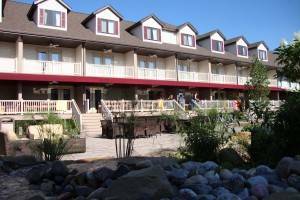 Put-in-Bay Online - Put-in-Bay Hotels, Lodging, Events, and more! Make your stay one to remember – check out all our beautiful lodging choices! Make your reservation to rent a golf cart today! Enjoy a fun weekend at Put-in-Bay! Find upcoming events all season long. Our exciting Put-in-Bay bars and restaurants offer entertainment all summer. Put In Bay Online is your one stop resource for South Bass Island, Ohio information! We offer everyone’s favorite downloadable Put-in-Bay Island Guide. Both this online Guide and the printable version have listings of Put-in-Bay hotels, home and condo rentals, and tons of vacation information. Take a look around and see why this popular Lake Erie island is a summertime destination spot. 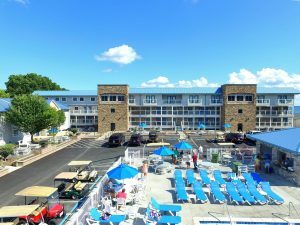 Hundreds of thousands of individuals, families, and corporate meetings call Put-in-Bay a vacation home during the summer. When you plan your vacation to Put in Bay, this is your resource for all the important island information. Put-in-Bay is one of the top 10 vacation destinations on Lake Erie and in Ohio. We consistently appear in magazine “top 10” lists for best small city. Recreational boaters and tourists alike consider Put-in-Bay to be the Key West of the North. Have you discovered our island yet? If not, we invite you to read more about us and plan your visit to this island paradise. Use this Put-in-Bay guide website to find places to stay, places to shop, places to eat, places to party, places to hold a meeting, and places to get married. 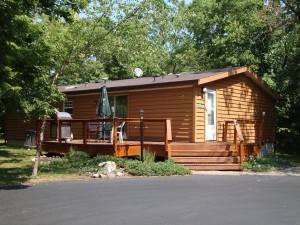 We can help you find the perfect Put-in-Bay cottage or summer home, hotel or resort. We can even help you find a brand new Waterfront Condo or a bed and breakfast. No matter if you want to be on one of the Lake Erie Bass Islands or the shores of Port Clinton, Ohio. Planning a weekend away from home? You have come to the right place. Boaters can find information about dockage at public and private marinas. After traveling to Put-in-Bay on one of the island ferry boats such as the Jet Express or Miller Ferry, you will find various modes of transportation. 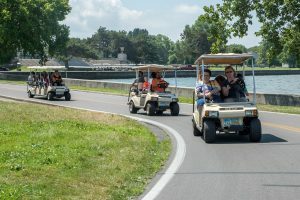 The most popular method is to rent golf carts, mopeds, or bicycles to get around this Lake Erie Island paradise. Be sure to visit Perry’s Victory & International Peace Memorial to learn about the history of the island and its importance in days past. There are also many other family and historical attractions in and around Put-in-Bay. Before starting your morning, or after a long day of sightseeing, you will need food! Restaurants and bars are plentiful across the island, with most conveniently located downtown. They are open to all types of groups, from casual dining to upscale. Stop by the Boardwalk for their world famous lobster bisque or visit the Put-In-Bay Pizza Co. 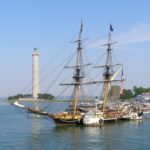 This Put-In-Bay guide should give you all the information you need to make your trip as fun as possible. We provide driving directions from major cities to the ferry boats (cars are recommended to be left on the mainland). Find unique gifts and souvenirs at the many island gift shops including nautical wearables at Misty Bay Boutique. If you can’t find the information you are looking for on our events or group tours pages, please contact us. We will be more than happy to share with you all the Put-in-Bay information you need. We are just an email or phone call away! Ohio’s summer vacation hot spot is here in the Lake Erie Islands at Put-in-Bay. 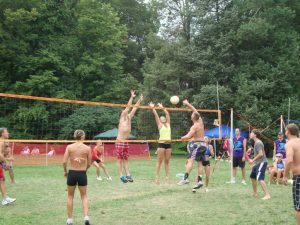 We also are a popular location for seasonal Bachelor and Bachelorette Parties. The island has played host as an Ohio vacation getaway for couples, singles, families, and business retreats for over a century. 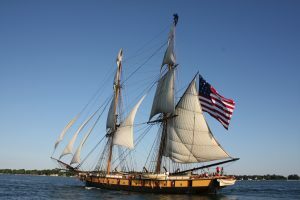 The old is mixed with the new as witnessed by our recent 2013 Bicentennial celebration, 2016 War of 1812 Reenactment, and other annual reenactments. Other great Ohio destinations can be discovered at the great Ohio Tourism Website which lists some great Ohio destinations. We hope to see you soon at the Bay! Specials – Win a FREE Weekend! Each summer, we award a free weekend lodging package to one lucky winner chosen at random from all entries received. Good luck! Click here to enter! Check out all our Hotel and Resort Rentals! Need a vacation? Check out all our holiday home and waterfront condo rentals! Find out what is going on at Put-In-Bay to plan your perfect weekend!